Time, we must find common ground. Time, we must have tolerance. Time, we must have compassion. Time, we must find harmony to coexist. Time and time again, ethnic cleansing has produced tent cities. 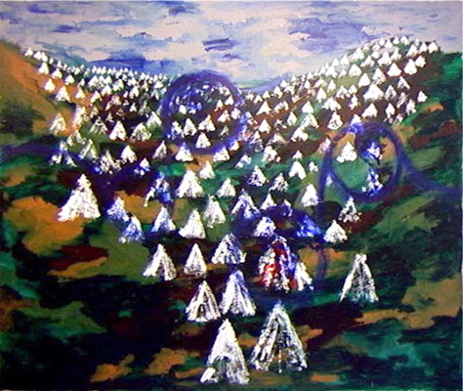 Camouflage mountains with refugee tents are the landscape of this painting. Beginning on the left hand side of the canvas, a continuous blue line creates four circles, all created from the same line that travels across to the right hand side of the canvas. The four circles represent time and evolution, the cycles of life.